Patsy Coleman may have spent her life writing music, but she has only started sharing her songs with the world this year. Coleman, 31, is one of the Saltwater Divas gearing up to perform at the Indigenous Women In Music Night at Happy Yess. 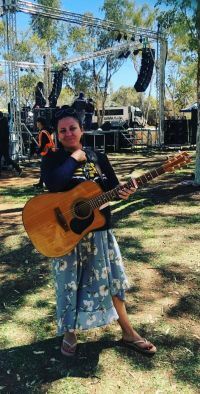 She joined the Saltwater Divas program this year after seeing the success of her friend in the Desert Divas program – run for Indigenous women in Central Australia as opposed to the Top End. “I wrote songs for years but the only person who heard them was my sister,” Coleman says. The step to share her music has already paid off. Coleman was chosen to perform at the Bush Bands Bash in September and is heading to the Nannup Music Festival in March. “Performing my songs is the best feeling in the world – I thought I’d known an adrenalin rush before, but there’s nothing like performing,” she says. Coleman writes her country blues songs about her life and mother-hood, and it allows her a chance to turn her mind off from her day job as a police officer. “It’s an amazing way to switch off and shows me more of the world outside my job,” she says. Coleman will be joined by fellow Divas Lynette Lewis (Desmo Lewis), Pauliesha McKenzie (Lyrik), Maree Yoelu, Noni Eather, Ray-Ray McKenzie and Sharna Phillips, who will each perform a solo set and a few joint songs, followed by a DJ set from Jadden Chisholm (DJ Chiz).